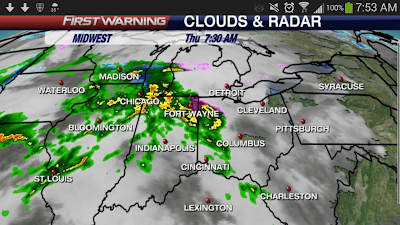 First line of showers and storms moving into Ohio currently and they will be in and out of here by noon. There have been some reports of small hail and even some lightning with the morning showers / storms. Tonight the timing is still looking between 9 p.m. & 1 a.m. Winds are still the main threat with the storms but there also is a very very slim chance that there could be a quick spin up of a tornado. Again the main threat will be the strong winds and heavy rains potentially causing flash flooding. The winds this afternoon and Friday will be very windy even without the storms. The storms will just help to accelerate the winds. The Storm Prediction Center ended up going a "Moderate Risk" just south of Ohio. For Ohio, the strongest storms, again, will be south of Interstate 70. I am heading to the garage now to try to do some spring cleaning / organizing since we will likely get to 60 degrees this afternoon . I am very likely being called into work later tonight to help cover the storms, on my day off. I highly recommend downloading our "Ohio WX" weather app. Once you set your notifications on there it will alert you for any watches or warnings issued later today. For right now it's a good idea to bring in any loose items that may be outside. Stay safe and have a good one.